ONYX DESIGNS™ is highly committed to ensuring consumer safety. We use only pure, high quality materials. ONYX melamine and plastic products are guaranteed to be BPA-free and toxin-free. Our products regularly undergo laboratory testing to ensure compliance with international health and safety standard as part of our commitment to safety. 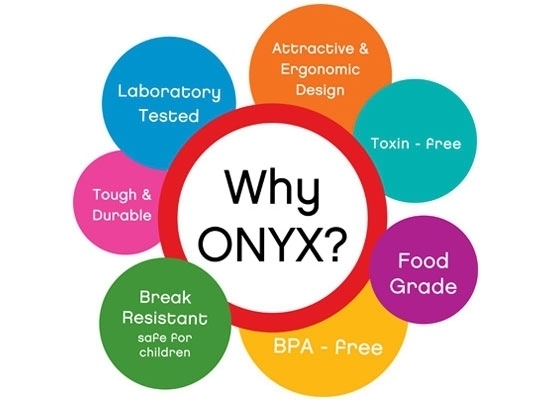 Toxin Free: When used under the proper conditions, ONYX products are safe and does not secrete any dangerous chemicals into the food and beverage. Food Grade: Food Grade is a certification by the U.S. FDA (Food and Drug Administration) determining that items are safe to consume from and to come into direct contact with food. Non-Food Grade products may release formaldehyde upon contact with hot substances, resulting in contamination of food and potentially serious health effects: headaches, nausea, vomiting (short-term) and cancer (long-term). BPA Free: BPA stands for Bisphenol A, a chemical that is used in the production of certain plastics that can be secreted into food and drinks from containers. BPA has been linked to health problems like cancer, diabetes, and obesity in young children. ONYX uses BPA-free plastics. Laboratory Tested: ONYX DESIGNS™ & SEIV™ by ONYX™ products are certified with SNI 7322-2008. Attractive & Ergonomic Design: Serving in plastic and melamine tableware does not mean boring! ONYX products feature attractive and ergonomic designs. Before releasing a new product, it undergoes a comprehensive testing process for comfort, utility, and durability. Break-Resistant: ONYX products resemble ceramic but is break-resistant when dropped, and are thus suitable for children. Products are always dishwasher safe. Tough & Durable: Besides the strong build of our premium products, ONYX dishware does not fade in their color after years and years of use. It is safe for daily use at home, institutions, and for the HORECA industry (Hotel, Restaurant, and Catering).